growing at a CAGR of 22.5% during the forecast period. 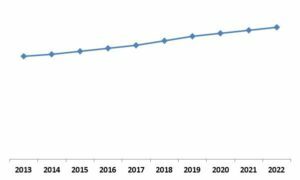 Global Smart Watch Market Revenue Trend, 2012-2022 ( In USD Billion) North America would be the prominent region for Smart Watches, largely due to favorable market conditions, holding $2,899.7 Million market revenue during 2016. However, Asian region with China leading the market would be the popular hub for low-cost Smart Watch manufacturers. Over the forecast period, the market would witness product based breakthroughs, with newer sensor technologies emerging. Also, as the market is still in its evolutionary phase, new companies would enter the market to explore untapped opportunities, eventually leading to a competitive market environment. Android is the most popular of the OS platforms for Smart Watches; nevertheless, iOS platform would strongly emerge, competing with Android systems during the forecast period. One other factor that would add to the growth of the iOs devices is Apple's move to offer bundled products and sell smart watches in the market, leading to popularity of iOS Smart Watches. The Personal Assistance segment would witness stead growth during the forecast period. 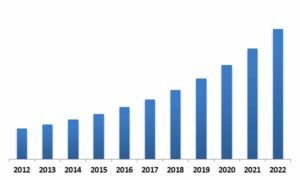 The Personal Assistance application had a contribution of nearly half of the overall Smart Watch application market and would remain as the major application segment. Wellness application on the other hand, is the second most dominant application. The wellness segment will witness steady growth due to the adoption of wellness monitoring devices. The report has exhaustive quantitative insights providing a clear picture of the market potential in various segments across the globe with country wise analysis in each discussed region. The key influencing factors of the global Smart Watch market have been discussed in the report along with the elaborated company profiles of Apple Inc., Samsung Electronics Co. Ltd., Sony Corporation, Google Inc., Lenevo Group Ltd., Garmin Ltd, Fitbit Inc., Nike, Inc and Adidas AG.